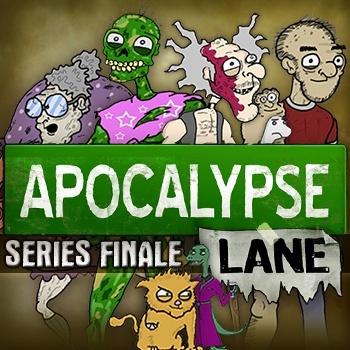 This Thursday at noon, The Escapist will present the epic conclusion to fan favorite video series, Apocalypse Lane. What will happen to the neighborhood? Will the "secret weapon" work? Will Cuddles finally show his true feelings for Gladice? Watch the series finale of Apocalypse Lane to find out! Test your memory of Apocalypse Lane with two different quizzes. The first quiz covers all of Season 2, while the second "impossible" quiz spans the entire series. Click here to begin and good luck! Refresh your memory of who's who and what's what before the big finale. As an added bonus, we've included some never-before-seen character concept art. See how the characters have changed over the series' run. You asked the questions, and now you will have your answers. Jon and Bryan answer your deepest and darkest Apocalyptic questions from behind the scenes of Apocalypse Lane. It all comes down to this. The future of the universe hangs by a thread. Will the secret weapon destroy life as we know it? Is the whole thing an apocalyptic hoax? Are our alien friends up to something even bigger? There is only one way to find out. Come back at noon on Thursday for the epic conclusion of Apocalyspe Lane! To watch all of the past Apocalypse Lane episodes and catch up for the Finale, visit our Apocalypse Lane video library and relive the adventure!